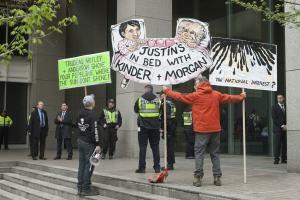 May 1 (UPI) — Provincial disputes over plans to expand the capacity of the existing Trans Mountain oil pipeline could have U.S. consequences, analysis shows. That opposition, the consortium added, has led to increased provincial tensions. British Columbia has filed legislation that could limit the flow of Alberta’s oil, while Alberta proposed its own legislation that could block exports of oil, natural gas or fuels to its neighbors. Saskatchewan has sided recently with Alberta. “The trouble is that as much as 60 percent of the 300 million barrels of oil per day traveling on the existing Kinder Morgan Trans Mountain Express crude pipeline from Edmonton to Vancouver is diverted via a lateral in Sumas, British Columbia, to feed U.S. refineries in Washington state,” Sandy Fielden, the director of oil and products research for Morningstar, said in a report emailed to UPI. “The same is true for Latin American crudes — that are in short supply these days,” Fielden said. Washington Gov. Jay Inslee in March signed executive action protecting maritime species in a move that Greenpeace said could complicate Kinder Morgan’s plans.